TuneClone Audio Converter for Mac is iTunes music conversion software that converts iTunes music m4p to mp3, aac to mp3, m4a to mp3 on Mac with ease and speed. The music tracks you purchased and downloaded from iTunes store are in an M4P format. If you want to play them with your BlackBerry Tour, you will need to get some software to convert iTunes music first. The following guide is going to show you how to convert iTunes music M4P to MP3, M4A to MP3 and AAC to MP3 on Mac OS X using TuneClone M4P to MP3 Converter for Mac, so that you will be able to play iTunes music on BlackBerry Tour. Step 1. Download M4P to MP3 Converter for Mac from www.tuneclone.com and run it. Create a new playlist and add the music tracks you are going to convert. Right click the playlist you just created and choose "Burn Playlist to Disc". Note: You need to tick the "Include CD Text" option to perserve the music metadata such as name, artist, album names. Click the "Burn" button to start burning. 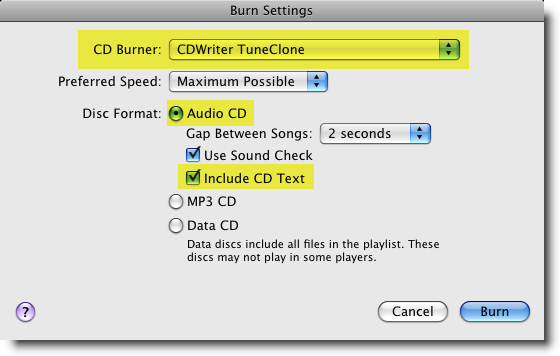 After the burning get started, TuneClone will automatically convert iTunes music to MP3 files. You can open TuneClone manager screen to check out the burning status. Tip: You can easily get the output MP3 files on your Mac machine by clicking the "Reveal in Finder" button on the manager screen. Note: The most important step is to choose the CD burner. Then the software can convert music files automatically. It is especially easy when you want to batch convert lots of files. After you get the output music files, you can transfer them to your BlackBerry Tour and then play iTunes music on your BlackBerry Tour. For more TuneClone tutorials, please go to mac.tuneclone.com/guide.php. TuneClone Audio Converter for Mac 2.3.0 was released on Jan 15, 2012! TuneClone Audio Converter for Mac 2.2.0 was released on Jun 14, 2011! 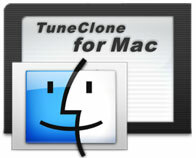 TuneClone Audio Converter for Mac 2.0.0 was released on Jun 2, 2011!